Do you want it all? Do you want it now? Are you looking for tropical living, a beautiful home, total privacy, convenient location and all the "bells and whistles"? Look no further. This fabulous 3 bedroom, den, 2 bath, 3 car garage home is ready for you to move in and make it your own. Every detail has been taken care of for you. Updated appliances, fixtures, pool, landscaping, pavers, exterior lighting and garage. Only the best here. 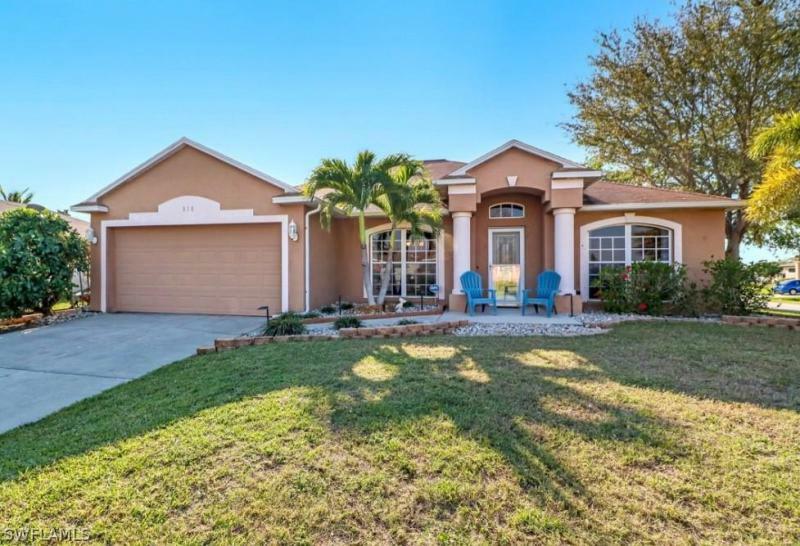 The large private yard gives you the freedom to really enjoy the florida lifestyle. Surround-sound bluetooth speakers will set the mood all day, every day! Your private pool and lanai with outdoor kitchen, outdoor shower, lush tropical plants and led lighting will create the perfect setting for relaxing and enjoying life. Schedule your private showing today you will be glad you did. Welcome to your brand new home!! The boardwalk is our newest 1,389 sf open concept floorplan with 3 br, 2 ba, 2 car garage home. Feel good knowing your home is a steel reinforced concrete block home! 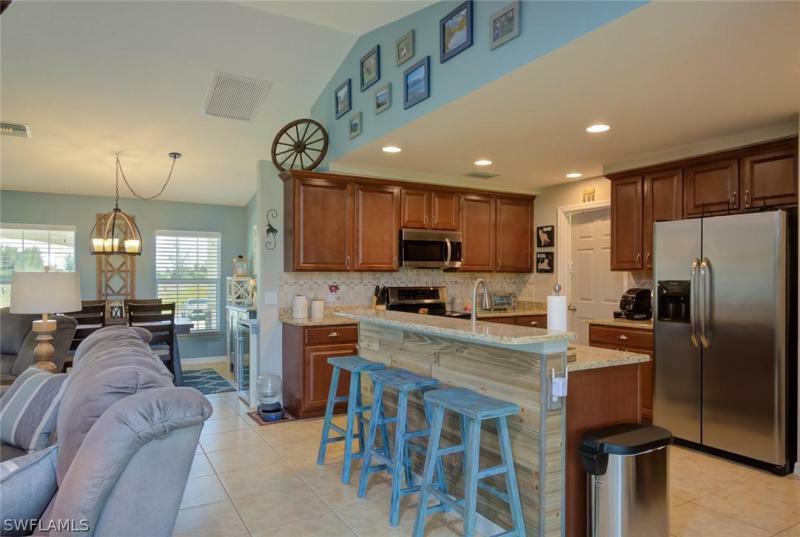 Located in the popular and growing gator circle area of ne cape coral hosting a community type feel without the monthly fees. Convenient to shopping, restaurants, interstate, minutes from downtown fort myers, cape coral beach and yacht club and several parks nearby. Our homes come with designer cabinets, 18 ceramic tile in all wet areas, brick paver driveway and more. Enjoy the latest smart home technology with a smart thermostat, front door lock, video door bell, hands free commands and more. This new home is much more energy efficient than an older homes and includes all new energy star appliances. No unexpected repairs because your new home has a full builders warranty. Owning a new express home has never been easier with several financing options. This is why owning a brand-new home from americas largest and most trusted builder is the smartest option. * photographs, colors, features, and sizes are for illustration purposes only and will vary from the homes as built. Welcome to your brand new home!! The boardwalk is our newest 1,389 sf open concept floorplan with 3 br, 2 ba, 2 car garage home. Feel good knowing this is a new steel reinforced concrete block home! 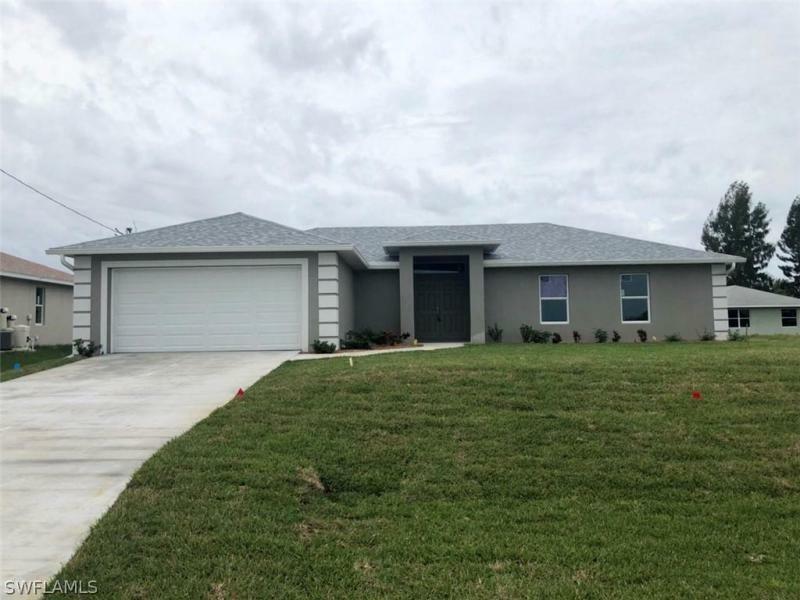 Located in the popular and growing gator circle area of ne cape coral hosting a community type feel without the monthly fees. Convenient to shopping, restaurants, interstate, minutes from downtown fort myers, cape coral beach and yacht club and several parks nearby. Our homes come with designer cabinets, 18 ceramic tile in all wet areas, brick paver driveway and more. Enjoy the latest smart home technology with a smart thermostat, front door lock, video door bell, hands free commands and more. This new home is much more energy efficient than an older homes and includes all new energy star appliances and free refridgerator and washer and dryer. No unexpected repairs because your new home has a full builders warranty. Owning a new express home has never been easier with several financing options. This is why owning a brand-new home from americas builder. * photographs, colors, features, and sizes are for illustration purposes only and will vary from the homes as built. Introducing move in ready with style. This meticulously maintained home has all the upgrades you want and plenty of room boasting 3 bed 2 bath and over 2200 square feet. Some of the impressive features of this home include: stainless steel appliances, new carpet in master suite, glass pocket doors in the den, large backyard with plenty of room for a pool, corian countertops in the kitchen with with breakfast bar, 42 wood cabinets with crown molding, custom tile backsplash, custom accent wall in the family room with stained cedar planks, freshly painted inside and outside, premium fan fixtures throughout, additional recessed lighting added in the family room, pre-wired family room for 5. 1 dolby digital surround sound, huge walk in master closet, large outdoor lanai space, vaulted ceilings in the main areas, 18 inch porcelain tile, wood laminate in the guest rooms, premium baseboards, crown molding, large master suite with full tile shower and dual vanities with cultured marble countertops, west facing rear exposure for gorgeous sunset views, a fence for the family pets & so much more! Schedule to see this one before its too late. Amazing opportunity to own a 2006 florida home ~ 3 bedroom, 2 bathroom ~ 1. 821 sqft under air ~ florida room ~ family room ~ dining room ~ new ac ~ chain fenced ~ screened comfortable lanai ~ masterbedroom with walking closet tub and dual sink ~ some tlc need it ~ quick response with the bank ~ make a liable offer and you will own a piece of paradise in cape coral florida ~ close to pine island ~ shopping ~ schools as mariner or island coast high school :)property in good condition. Sw cape coral gulf access in beach parkway and oasis blvd, location! Location! With long and wide water view. With over 2000+sq. Ft. This home features an open great room floor plan. 3-bedrooms+ den- or 4 bedroom. New roof-2018, new pool system and new heatpump-2016, new air-condition-2016. Ideal for families or vacation rental. Amazing corner home located in cape coral larges growing area. This beautiful 4 bed 2 bath corner lot offer 1600 square feet of living and has plenty of room for a large pool. This home offer granite kitchen tops and bathroom tops as well. Don't miss this wonderful opportunity to own this very home today. Brand new construction 4-bedroom home. Raised front entry with double doors that enter an open floor plan with cathedral ceilings. 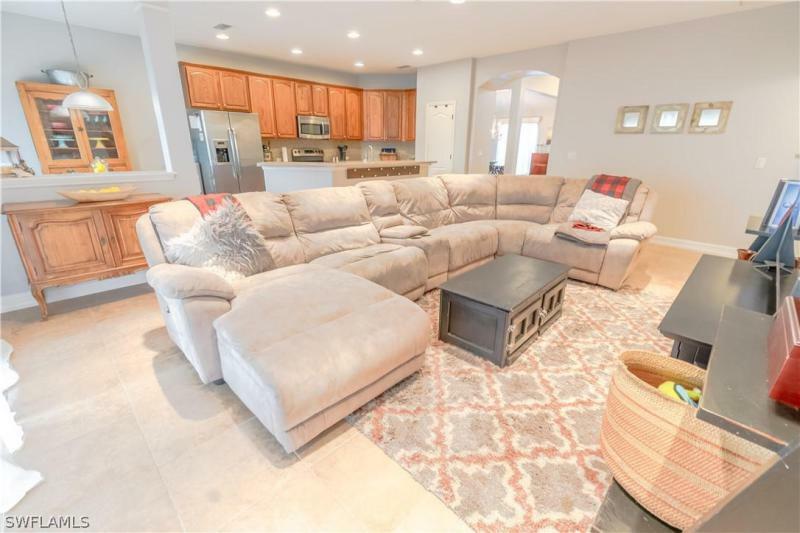 Solid wood cabinets with soft-close doors, fantasy brown granite countertops with center island that has ample seating, stainless steel appliances, upgraded electrical fixtures. Porcelain plank tile throughout the entire home. Large rear patio under truss, and plenty of room or a pool. Floratam lawn with sprinkler system and beautiful landscape package. Sw exposure convenient location with close proximity to del prado. 2/10 builder warranty. Home is in an x flood zone so mortgage company does not require flood insurance; you can buy a preferred risk flood policy very reasonably. Well-built home by a reputable local builder that meets current building codes including storm panels, and engineered to 160 mph wind speed.